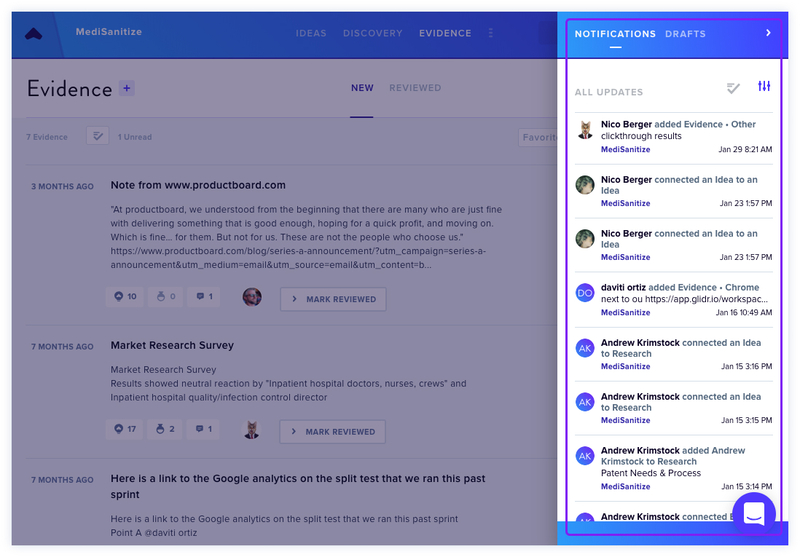 GLIDR puts feedback, discovery and validation at the center of your product development process. 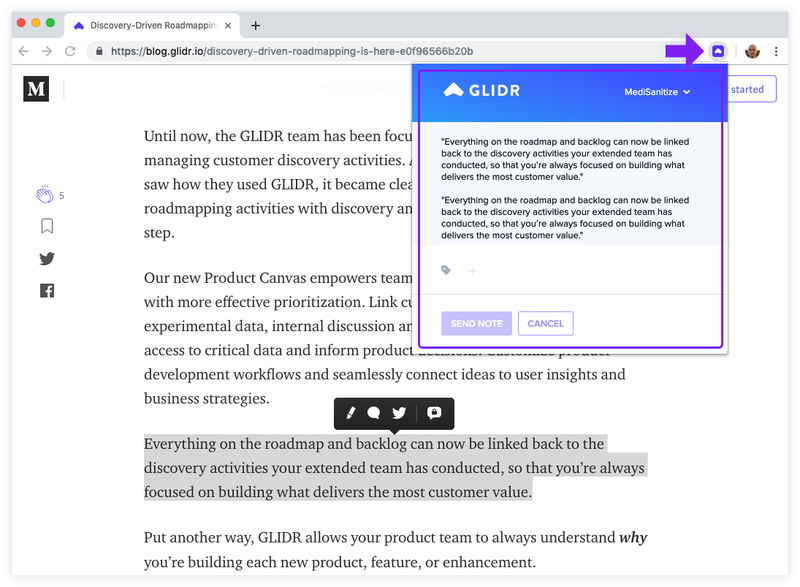 As a Team user, GLIDR gives you tools to set up a robust product roadmap, test your Ideas through Research & Experiments, and connect validated Evidence. 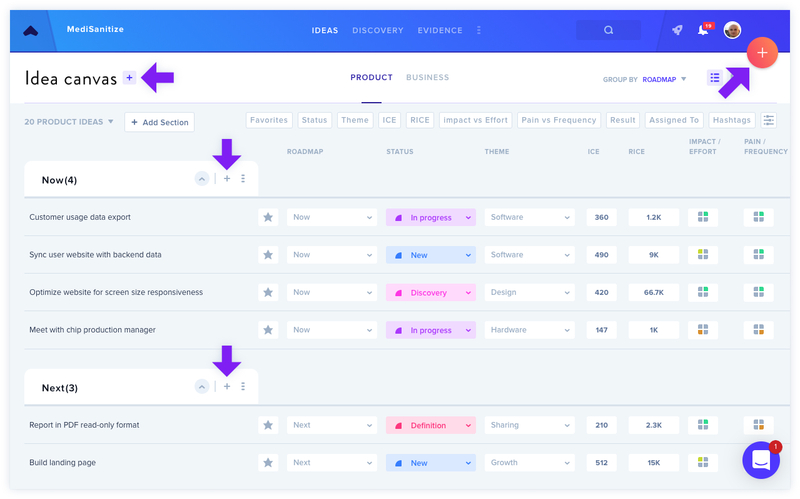 GLIDR Team offers a Business Canvas and Product Canvas, allowing you to distinguish the ideas that are directly related to your market vs. related to your product. Different teams work in different ways. That's why we've made GLIDR customizable to your needs. You can categorize your Ideas by Roadmap, Status and Theme. 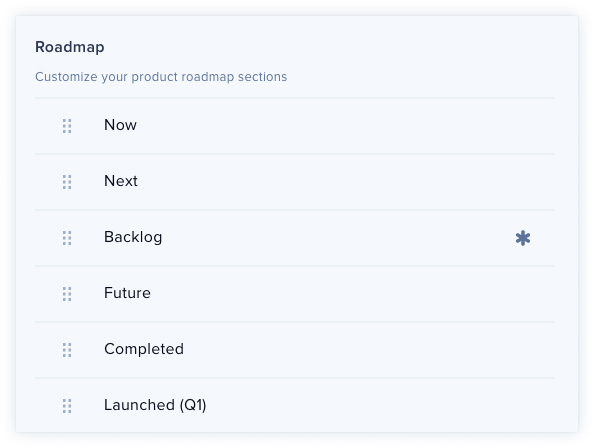 When you start your Project, you'll find that the Roadmap and Status categories are already filled out with suggested titles, but you're free to change them as you wish. 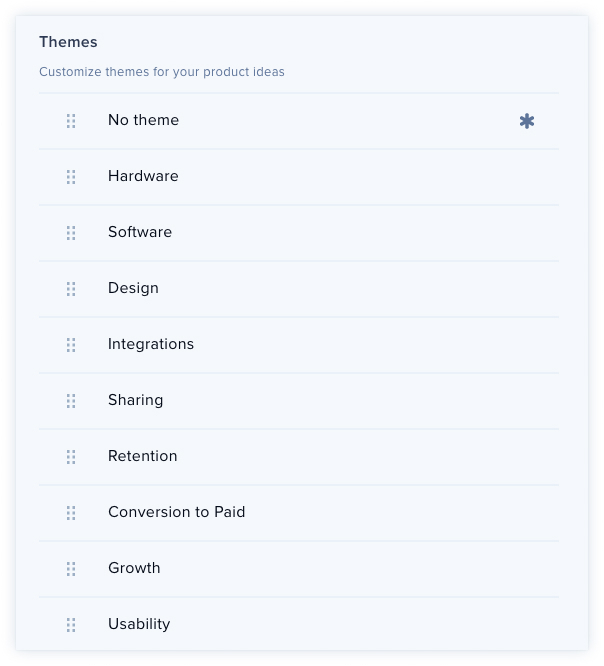 To add or edit your categories, navigate to Team Settings, then Product Ideas or Business Ideas. Here, you'll be able to add, edit or delete categories. You can also edit Canvas sections in Kanban View. 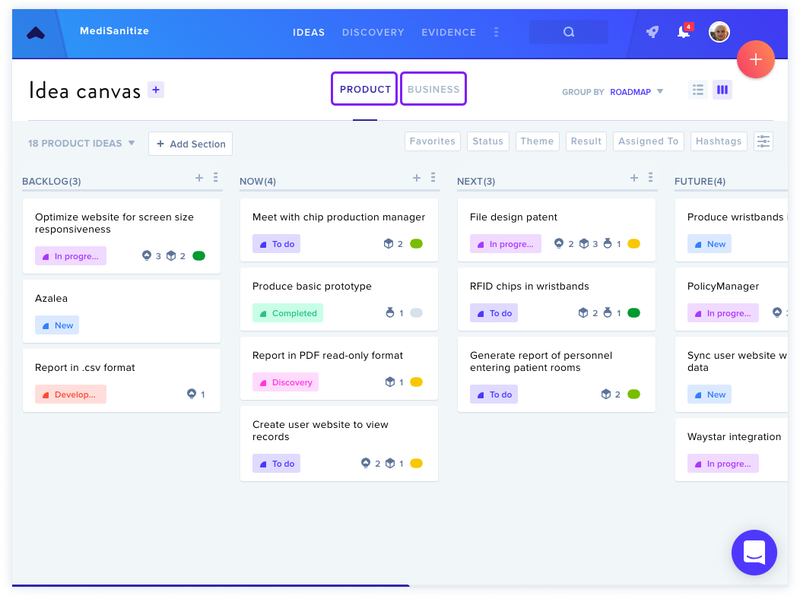 The default view is the Roadmap, which allows you to plan your Ideas in order of priority, such as Now, Next, Future and Backlog. You can also drag and drop your ideas within each category. 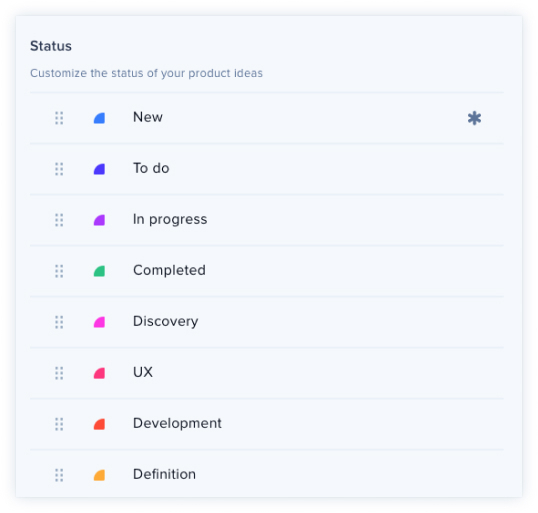 Grouping by Status allows you to view how your Ideas are progressing based on the categories you choose; allowing you to see all In Progress ideas grouped together, for example. Themes are a way of defining broader concepts, such as Hardware and Software. These categories are fully customizable. It's easy to start filling out your canvas. Navigate to any of the + buttons to begin adding ideas. Keep it brief! There's a 100 character limit, but you can click on your idea to add more detail and expand on your thoughts in the "Summary" section. A powerful way to organize and prioritize your Ideas is to use Product Scoring. Using one or more of the scoring methods to evaluate your Idea, with a numerical value such as RICE or a matrix such as Pain vs Frequency allows you to confidently assess which Ideas to progress through your roadmap. Prioritizing your Ideas can be done by dragging and dropping the individual cards, which can also be done in List View, or by changing the Idea Status. Once you've started adding Ideas, it's likely you'll be gathering evidence that will ultimately help you validate or invalidate your ideas. This can be in the form of customer discovery interviews, A/B tests, smoke tests or one of various other tests. 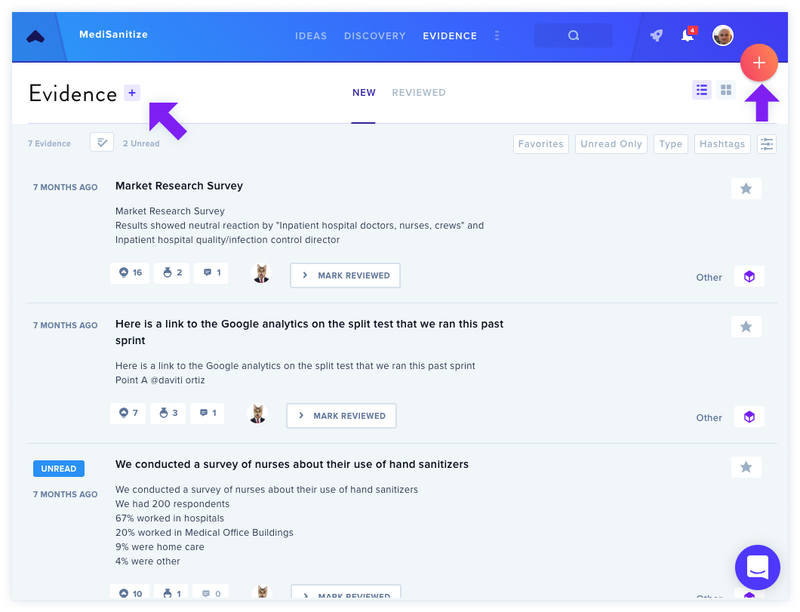 By navigating to the Evidence section of your Team, you can begin adding Evidence using the + button. The Evidence tab is also where you will see other ideas that have already been added by you or your teammates. 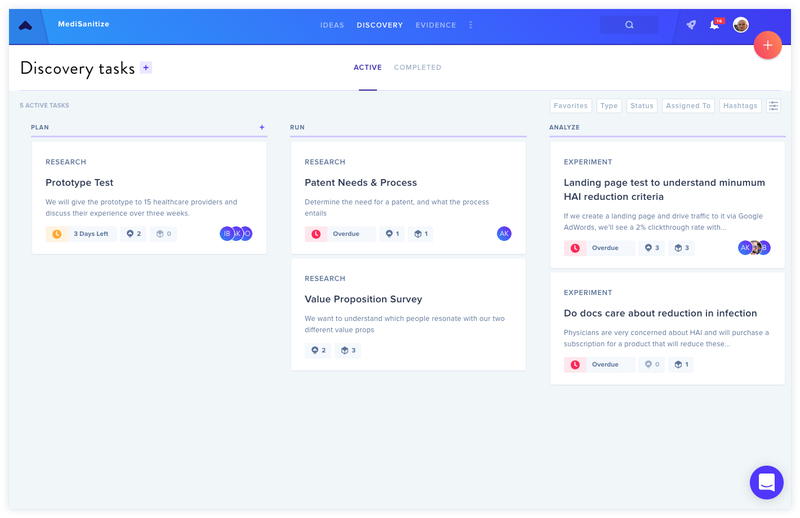 In the same way as adding an idea, the Summary section gives you space to enter a customer discovery interview transcript, results from a landing page test, and any other relevant information relevant to your evidence. Connections are a way of linking two related Ideas or items of Evidence. For example, when adding an item of Evidence, you can link this to any Ideas that it relates to, or create a new Idea based on what you discovered. If you're looking at your Roadmap in List View, it's easy to connect ideas by selecting the Connect Ideas icon and choosing the Ideas you would like to link to the current selected Idea. You can design Research (researching without a determined success metric to generate new ideas) or an Experiment (testing a specific idea to get a precise yes or no result) to gather evidence and test ideas. 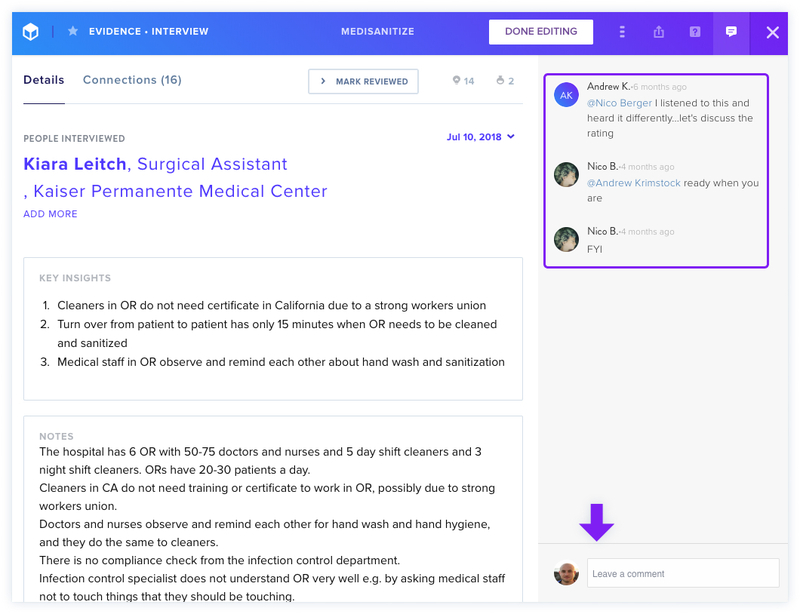 Commenting in the GLIDR platform is a quick and easy way to let other team members know your thoughts on ideas, evidence, experiments or posts. 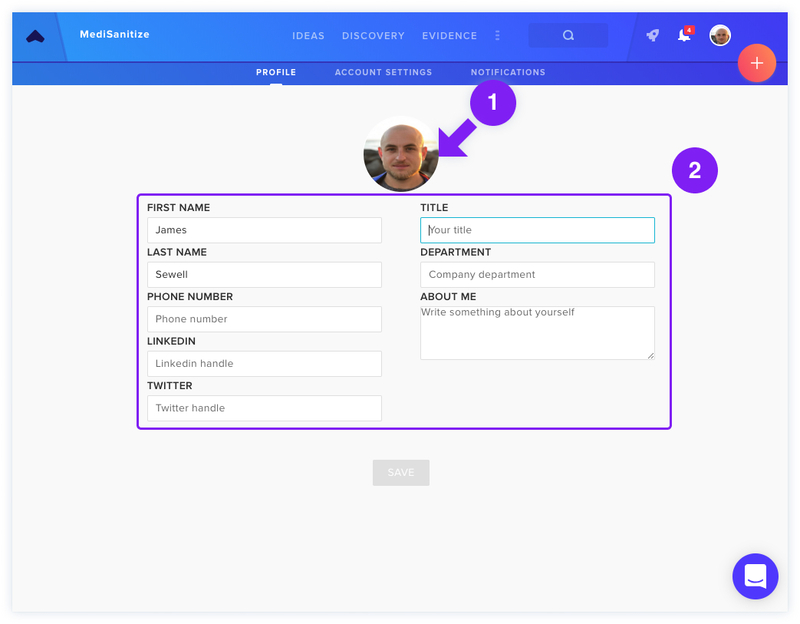 You can also @mention specific teammates if something needs their attention or input. Now that you've got started with GLIDR, it's time to begin inviting your teammates!